Preheat skillet or griddle over medium heat and coat with nonstick spray. Heat oven to 180 degrees. Using a mixer, combine eggs, buttermilk, butter, pumpkin, sugar and salt in a large bowl. Add remaining ingredients and blend until smooth. Pour about 1/4 cup batter onto hot skillet or griddle for each pancake and cook 1-2 minutes until batter stops bubbling and edges begin to harden. Flip pancakes (they should be golden brown) and cook other side 1-2 minutes more until golden brown. Place cooked pancakes on oven-safe plate or baking sheet and keep warm in oven while cooking the next batch. 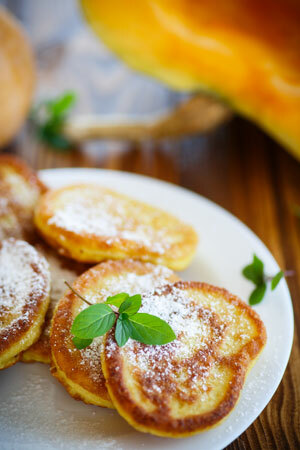 When all pancakes are cooked, sprinkle with confectioners sugar and serve warm with syrup. Makes 16 pancakes. Published on October 29, 2018 in Entrees.